I will say, though, that although House in California did not remind me of Mystery House, it did sort of remind me of Sneak ‘n Peek for Atari 2600. Whoa, I don’t know that one. It is a game that takes place in and around a house, and the way the blocky pixel figures moved around the house actually reminded me of that. So Sneak ‘n Peek is a game of hide-and-seek that you could play with two players, but one player would have to physically hide his eyes—like, in life?—while you hid your character onscreen? And then he’d look for you. And that is one of my earliest memories, is playing that game. So that game, Sneak ‘n Peek, you should look for it! It’s like a more candy-colored version of House in California. Hummingbird Mind reminded me a lot of A House in California. You made that before House in California? Well, I actually kind of took a break from House in California to work on [garble] so they’re kind of the same [blurp]. Because I had been thinking about what it would be like to make a kind of diary game about being trapped in a limbo in my parents’ house, and all the player would ever get to do is, like, drink beers and wander around. Like, make a cup of coffee and then pour it out, and then make another one. And that’s all you’d get to do. And so you made a game about, like, checking the mail and doing the dishes. But it isn’t really about doing the dishes. Well, yes, it’s about kind of daydreaming. Well, or about a game designer who’s trying to clear enough of a mental space to get to work. Is it supposed to feel like a kind of diary-game, though? Or like an autobiographical game? ‘Cause, House in California, too, felt really autobiographical, in a way? But then not, also. Because it’s describing such a collective… feeling? Eh? “Eh?” [laughs] I mean, I guess I was thinking of just short, like, flash fiction, and slice-of-life short fiction kind of stuff. And yeah, all that material was totally sourced from what was going on with me at that moment, where I had a bunch of big projects, and I was like, just getting really distracted. Um. [clears throat] But also…. It’s also kind of like it’s a little bit magical, so I was trying to… Like, I really like letting myself be distracted, and letting my mind wander? I was talking to my friend Chris about that yesterday. I was telling him to go play your games because—okay, so a lot of the, yeah, it’s like, uh, the main character’s inner life, or interior life, is layered on top of the game’s reality. I don’t want to be like, “Like Inception!” Uh. But there are these concentric layers of—hang on just a second. Two seconds. What? Okay, now I’m really distracted, because I hear her talking about pie. Yeah, I can hear “pie” in the background. Oh, my God! I’m sorry! [laughs] Um, okay, so I am sitting at home playing a game where the person I am playing is thinking about other things, so I’m having to think about those things, too. And that was curious, because with, not books, but movies and video games, there’s usually that very linear narrativity happening that isn’t informed necessarily by the characters’ inner lives. 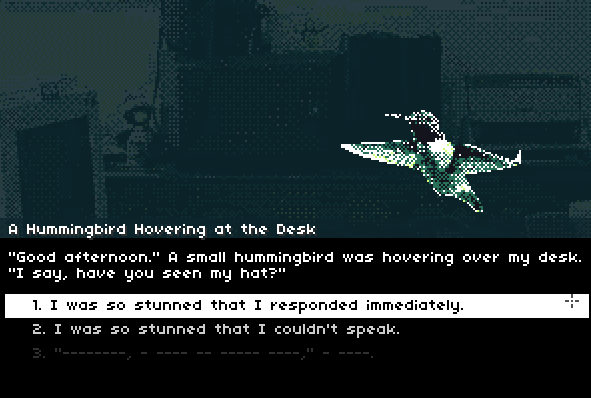 I don’t know, I guess I also kind of imagined the players—I always imagined Hummingbird Mind as happening on Flash [game] portals, existing on Flash portals, so the players are kind of in that state, they would be in a state of distraction when they get to the game. They’re on this Flash portal because they have something important that they should be working on. So they would run across this game and be able to get in, or already be in that mode, in order to kind of role-play that mode for a little while. Yeah. In that one, yeah. —to add itself unto the game and the inner life it is describing. Jenn, this is super cool.